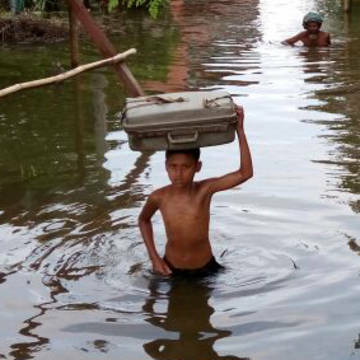 Despite receding flood waters giving hope to the hundreds of thousands who are now homeless after the Kerala floods, CAFOD warns that families who have lost everything need to be protected against disease outbreaks in relief camps. In the worst floods in a century, torrential rainfall in the Southwestern state of Kerala has left over 300 dead and hundreds of thousands homeless, with many still stranded, running out of clean water and food. CAFOD is working alongside local partner Caritas India, who are already responding to the crisis with a project that will provide food and essentials such as hygiene products to over 32,000 of the most vulnerable and marginalised people of Kerala. Alongside the distribution of food and hygiene items, Caritas India is also providing information on hygiene ‘best practice’ to the affected communities to help stop the spread of disease. “Unprecedented monsoon rains in Kerala have washed away whole villages and left communities homeless. Crops and livestock have been destroyed. Many families arrive at relief camps with only the clothes they are wearing. They have lost everything. The unrelenting rain which began in July and spiked in early August, caused flooding and landslides across the Kerala region, leading to the Indian military to launch rescue efforts to reach those communities who had been cut off for several days. “In addition to providing emergency assistance such a clean water, food and shelter, we must look at the preventing outbreaks of diseases like cholera, which are likely to affect this extremely vulnerable group,” says Giovanna Reda. Through the START FUND project, CAFOD and Caritas India are providing WASH (water, sanitation and hygiene) kits, blankets, mosquito nets, and awareness raising to affected communities. Through the Caritas Internationalis Emergency Appeal, Caritas India is providing WASH and food kits, which are complementary to the Government distribution. CAFOD is the Catholic Agency for Overseas Development and is a member of Caritas Internationalis. CAFOD works with communities across Africa, Asia, Latin America and the Middle East, to fight poverty and injustice. The aid agency works with people in need regardless of race, gender, religion or nationality. For further information, briefings or media requests please contact: Elouise Hobbs on - Email: ehobbs@cafod.org.uk, Landline: 020 7095 5453, Mobile: 07954 077 426 or CAFOD out-of-hours media hotline: +44 (0)7919 301 429. Please give today to help people who have lost everything in the floods and landslides.